And it is for this that I find it heartrending that so many others don’t exhibit the same behaviors nor hold the same beliefs. It brings to mind Rodgers and Hammerstein’s poignant musical South Pacific in which we hear, “You’ve Got to Be Carefully Taught” – bold words in a song which illustrates that prejudice, intolerance, and narrow-mindedness all are learned. And now there’s a similar message which has come to Hartford Stage’s boards, brought by brilliant Academy Award-winning actor, author, screenwriter, and LGBT rights activist James Lecesne in his moving one-man show, The Absolute Brightness of Leonard Pelkey. 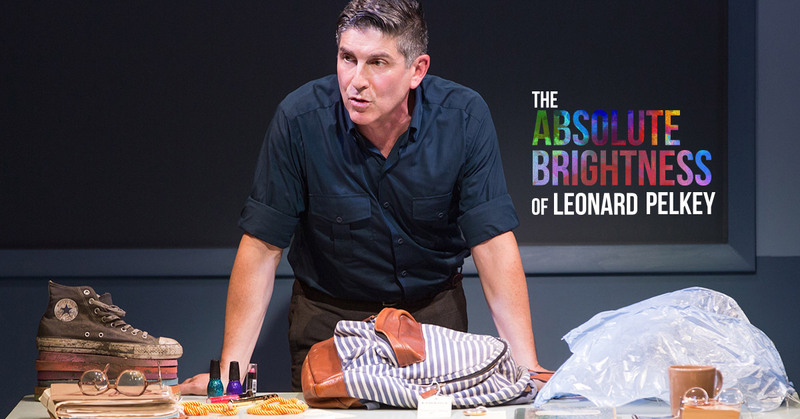 The illuminating production (pun intended), adapted from Lecesne’s 2008 young adult novel The Absolute Brightness, is a compelling tale about the many faces of beauty both inside and out. It is about courage and compassion, yet concurrently, cruelty and callousness. And it conveys the message that we should embrace the differences among us in all of the ways that truly matter. When young, flamboyant 14-year-old orphan Leonard Pelkey comes to live with his sullen and inhospitable cousin, 16-year-old Phoebe Hertle, and his larger-than-life hairdresser Aunt Ellen at their Jersey Shore home, he turns their strange little world on its ear. Everyone who meets him in some way is affected. Then just like that, he’s gone. In the wake of the crime, we quickly learn he’s left as much of an impact on his family and friends in his absence as he previously had in his corporeal existence. The whodunit-like tale is told by machismo police detective Chuck DeSantis who takes us through the course of his investigation, giving us snippets of what Leonard really was like through his interactions with many of the people who knew him. Leonard had been a dazzling light, a power that brought out something special in most everyone he met – and he brought truth. But what makes this show a veritable tour-de-force is that Lecesne himself effortlessly morphs into each and every one of the colorful characters – from Phoebe and Ellen, to an elderly German shopkeeper and a mobster’s widow, to numerous others. In his clever genius, he masters each voice and mannerism, and like in life, brings us alternatingly to both laughter and tears. Once the stage is set and the characters exposed, it isn’t difficult to figure out the mystery – either who did it or why. We know that sadly, someone had a problem with who and frankly what Leonard was. Leonard was gay and chose to live his life the only way he knew how – through genuineness and congruence in all things; and even as a young adolescent, he’d already found a healthy state of being. But someone had to douse his brilliance, and while they may have succeeded in causing his death, Leonard’s infectious energy and gentle spirit lives on. 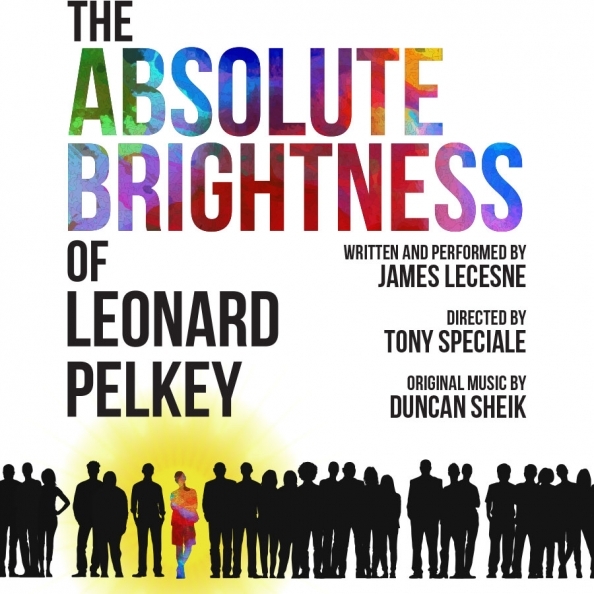 Directed by Tony Speciale, Absolute Brightness is pure delight from start to finish as is the uber-talented Lecesne. Simple scenic design by Jo Winiarski is perfectly accented with projections by Aaron Rhyne and original animation and photography by Matthew Sandager. Kudos to Matt Richards for lighting design, to Christian Frederickson for sound design, Paul Marlow for clothing, and Duncan Sheik for original music. 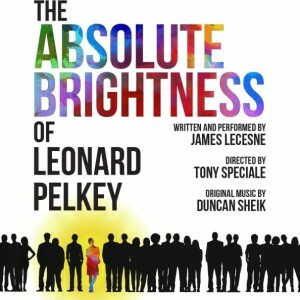 The Absolute Brightness of Leonard Pelkey is a show of great importance in our continuingly tumultuous social landscape, but throughout, there are smiles through the sorrow, hope amid despair, and for certain, brightness punctuating the darkness. Lecesne is remarkably masterful and Hartford Stage once again has succeeded in bringing enlightening and relevant work to our Connecticut cultural arena. Let’s admit it right up front, one-man shows (or to be politically correct, one-person shows) are tough gigs to pull off successfully. There are countless hurdles to overcome: monotony, claustrophobia, heine itch, tedium, and the simultaneous inflation of air and stretching of eardrums (yawning). Yes, many actors have been able to do it including Hal Holbrook, Eric Bogosian, Spalding Gray, Larry Luckinbill, Elaine Stritch, and others. But the actors must be of a certain breed – an actor’s actor. They have to be like Shrek’s onion – full of nuanced layers. They have to be engaging, stimulating, charming, versatile, spontaneous, funny, irreverent, and MOST OF ALL, they must be storytellers. 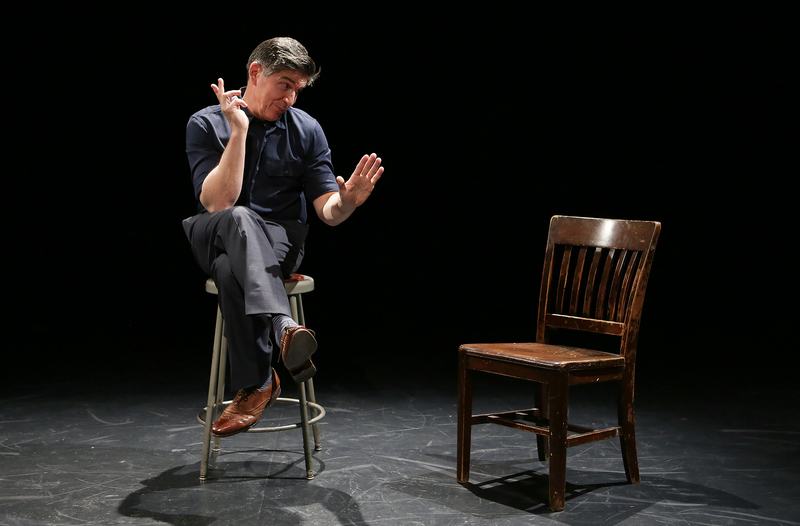 Hartford Stage’s The Absolute Brightness of Leonard Pelkey has a master storyteller in the guise of character actor, author, playwright (and a plethora of other hats) James Lecesne. His Absolute Brightness is both brilliant and illuminating (pun intended). Lecesne adapted his 2008 young adult novel into a solo show. The story involves the retelling of the investigation and senseless murder of a fourteen-year-old boy because he was different. But his life and death left an indelible impact on the lives of a small New Jersey town where he lived. All of the characters are played to the hilt by Lecesne. With a 360-spin, Lecense morphs from one character to another with incredible aplomb and verve. Indeed, from body language to voice and mannerisms, the transformation is complete in an instant. Although we never see Leonard Pelkey, we get to know him well through the impact he has had on the people around him. Phoenix and Christ imagery abound. Just like that of R. P. McMurphy in Ken Kesey’s One Flew Over the Cuckoo’s Nest, Pelkey’s death is far from being in vain. His indomitable spirit lives on in the lives that he touched. And like the immortal phoenix rising from the ashes, his innate “difference” which led to his death, inspire others to stand up for themselves and dare to be different. Make no mistake, Absolute Brightness is a morality play for our troubled times. As other reviewers have noted, it’s hard to conceive of a play that involves what appears to be the senseless and meaningless murder of an innocent, beautiful soul like Leonard Pelkey and walk out inspired, uplifted, and possibly even spiritually sated. But that is the net effect on most of the audience. 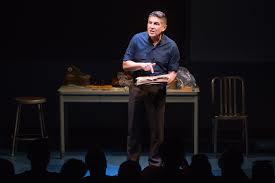 Obviously, much of the credit has to go to James Lecesne as writer and performer. But as the poet John Donne wrote centuries ago, No Man Is an Island. Similarly, even a one-person show is usually dependent on the support and work of others. 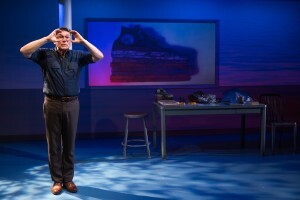 In the case of Absolute Brightness, Director Tony Speciale did a fantastic job of staging and pacing, ultimately ensuring that there was not an iota of dull dreariness, didactic pontificating (which the play can certainly run the risk of in lesser hands) or trite banality. Nods also must go to Duncan Sheik (Original Music), Jo Winiarski (Scenic Design), Matt Richards (Lighting Design), and Aaron Rhyne (Production Design). I must confess that the denouement was a bit abrupt for me (I would have liked more of a build-up to the revelation of the murderer). Of course, that could be because of my penchant for whodunits. Nevertheless, Absolute Brightness is a thought provoking, intellectually stimulating piece of exceptional theatre.